How could Noah fit all of the animals onto the Ark? How is it possible that they could all have survived for 40 days and 40 nights? How did Noah do this? Most people might not realize the incredible size of the ark built by Noah. I believe that the Ark was built big enough not only for each of two kinds of animals to fit in to but also had room for anyone who would repent and trust in God and come aboard the ark and be saved. According to the dimensions given in the Bible and translating cubits into feet, the ark could well have been over 500 feet long, almost 92 feet wide and 55 feet tall. The length of the ark then would be over 1 & ½ football fields. The ark’s total square feet available was anywhere from 2 to 3 million square feet! The ark also had three levels or floors in it and dozens of compartments to accommodate the different types and sizes of animals on board. In the book, Noah’s Ark: A Feasibility Study by John Woodmorappe, he estimates that around 15% of the animals on the ark would have been larger than a sheep . When God directed two kinds of each animal to go onto the ark, they may have been infants. That is, these animals could have been the very young, thus making it easier for all of these to fit onto the ark. Many animals, perhaps even some dinosaurs, were not directed to board the ark and thus may have drowned and become extinct in the flood. There is strong fossil evidence that the earth was covered by water at one time and that many species did not survive this flood. These animals may have been allowed to be wiped out because they were not necessarily beneficial to mankind as Noah and his family repopulated the earth. Whales, fish, clams, and other sea creatures had no need for shelter and simply survived in the oceans without any need of the ark. What Went onto the Ark? In Genesis chapter 6 we see what animals went onto the ark; “And of every living thing of all flesh, you shall bring two of every sort into the ark to keep them alive with you. They shall be male and female. Of the birds according to their kinds, and of the animals according to their kinds, of every creeping thing of the ground, according to its kind, two of every sort shall come in to you to keep them alive. Also take with you every sort of food that is eaten, and store it up. It shall serve as food for you and for them” (Genesis 6:19-21). God also told Noah to bring into the ark, “seven pairs of all clean animals, the male and his mate, and a pair of the animals that are not clean, the male and his mate, and seven pairs of the birds of the heavens also, male and female, to keep their offspring alive on the face of all the earth” (Genesis 7:1-3) and “every beast, according to its kind, and all the livestock according to their kinds, and every creeping thing that creeps on the earth, according to its kind, and every bird, according to its kind, every winged creature. They went into the ark with Noah, two and two of all flesh in which there was the breath of life. And those that entered, male and female of all flesh, went in as God had commanded him” (Genesis 7:14-16). According to the dimensions given in the Bible and translating cubits into feet, the ark could well have been over 500 feet long, almost 92 feet wide and 55 feet tall. So every species that would survive the flood was brought into the ark and again these may have been the very young. Also, every type of provision like water and food was brought onto the ark to ensure that the animals and Noah’s family was to survive as God commanded Noah to “take with you every sort of food that is eaten, and store it up. It shall serve as food for you and for them” (Genesis 6:21). Genesis 7:16c indicated that it was “the Lord [who] shut [Noah] in.” The analogy is that it is the Lord Himself that does the saving. The ark was covered with pitch to protect against the waters of the flood. The word “pitch” in Hebrew is kopher, sometimes spelled kophar, which means “atonement” or “covering.” The symbolism is perfect for God Himself, in Jesus Christ, became our covering or our atonement. The flood is seen as a type of baptism for Noah and his family but the floods are symbolic of God’s judgment on sinners. The ark is a picture of God’s process of salvation. Anyone who chooses to come will be saved and the ark [Christ] is the only possible escape from death. And there was only one door into which to enter the ark, which reminds me of what Christ said, “I am the door of the sheep” (John 10:7) and “he who enters by the door is the shepherd of the sheep” (John 10:2), thus there is only one way to be saved (Acts 4:12). The Lord God Himself not only closes the door, but seals it, which seems to be indicative of the sealing by God the Holy Spirit which Paul writes about in Ephesians 1:13b that you “were sealed with the promised Holy Spirit.” Noah could no more have shut the door and sealed it than we can save ourselves. The ark reminds us that we are saved by faith and not by works because by “faith Noah, being warned by God concerning events as yet unseen, in reverent fear constructed an ark for the saving of his household. By this he condemned the world and became an heir of the righteousness that comes by faith” (Hebrews 11:7) but Noah is also a reminder that “if [God] did not spare the ancient world, but preserved Noah, a herald of righteousness, with seven others, when he brought a flood upon the world of the ungodly,” (2 Peter 2:5) likewise God will also punish all who refuse to come to him. God truly desires to save those who are presently lost. God is patient but we must choose today to be saved for this is the day of salvation. Noah preached for 120 years because God desires that none should perish (2 Peter 3:9) and He is longsuffering. We base this number of years Noah preached from the fact that he was 600 years old at the time of the flood and he would have started preaching at age 480 but the point is, even God may decide that the sinner’s time is up (Genesis 6:5) so “now is the favorable time; behold, now is the day of salvation” (2 Corinthians 6:b). We don’t know if we will live beyond tonight or tomorrow so I plead with you to not put off the opportunity for eternal life today. James warned us to not say, “Today or tomorrow we will go to such and such a city, spend a year there, buy and sell, and make a profit”; whereas you do not know what will happen tomorrow. For what is your life? It is even a vapor that appears for a little time and then vanishes away” (James 4:13-14). So my advice is that “Today, if you hear his voice, do not harden your hearts” (Hebrews 3:15) because if you die without Christ, you will live with eternal regret and that would grieve the heart of God. As a scientific point, I want to also point out that there were probably not as many as some people imagine when they read two of each kind. We have many varieties of animals today, but a lot can be grouped in families of animals. We have many wolfes, foxes, dogs, but they all belong to the canine ‘kind’, thus, a pair of the so called ‘proto-canine’ would be all that is needed for all the canines we have today. The same can be said in all other animals. Of course our God also works supernaturally, and could have done any number of miracles that would have made it possible. With God all things are possible!! Amen Mr. Reese….you make excellent points. These are valid points that I wish that I had included but you have so wisely said. Thank you sir for contributing to this article. Jack, I really liked your article. I had never connected it with Jesus and His sacrifice so this was quite a lesson for me. My favorite part of the whole story is the part that is not there. After the flood had recessed there must of been an unimaginable amount of work for God as He renewed the lands, and the fields, and the forests. But yet, God faithfully kept all His promises and made the Earth plentiful for both Man and creature. I believe that even if God tells you “No”, He will never let you down or betray your trust. Great point Steven. You are so right. You are also spot on sir about God saying No as a means of doing what He knows what is best for us (always the case). I remember a missionary who missed or got bumped for a flight for a trip to South America and thought to himself, “God, you wanted me to go to and now you are saying no. Why?” The original plane never made it…crashing into the jungles of the Amazon river basin. All souls were lost. No in this case from God saved this man’s life. Wonderful bible exposition about Noah’s Ark. I like the Analogy of the Ark as Salvation. It reminds me of my experienced with a Jehovah’s Witness member which is one of my work mates. We are on a same room on that night for a official business trip to our design engineering facilty and we’re ready for rest. Suddenly he shared about their beliefs. In his words related to Noah, I understand that they were like Noah’s Ark, that they were like biulding an Ark that anyone would come joined them will be saves. After hearing, I commented on his words. 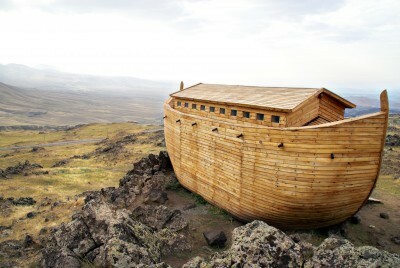 I said that in relation to his topic I can see only one person that I could relate to the Ark that Noah’s built today. He is JESUS. Salvation could not be found in anyone else, or any organizations even the church I said. I continue to quote Matthew 11:28 “Come to Me, all who are weary and heavy-laden, and I will give you rest.” This is the only verse that knew that could possibly relate to our conversation during that time. Though he still insisted, I just continue listening instead but in my heart I have already share the truth about Jesus, I said to myself. I just hope that the words I shared would lead him to the truth of Jesus. I have nothing more to say. so we end up and sleep. I just respect what he believes and so he is with mine. I don’t wan’t to argue with him I leave it all to the Holy Spirit. Joel, I am just so blessed that you care enough to witness to your JW co-worker. Since we know that salvation is fully of God then we can only witness to them and pray that the Holy Spirit does His work of convicting people of their sin, to see their need for repentance, confession, and for a Savior. I love what you said that you must leave it up to the Holy Spirit and not argue with him. Nicely said. We must remember that with God all things are possible. God bless you, brother. Thank you Robert…I always appreciate hearing from you because you are always an encourager….and a fellow saint in whom I respect and admire. Thank you Crystal for your words of encouragement my friend. I am overjoyed that you have returned to the Lord and may God richly bless your walk with God today and in the future. Its a joy to have you here. This is the first time I have come across you Mr Wellman and I have really been blessed by this article on Noah. I hope you don’t mind, but I will be sharing this with our Home Study Group when we recommence in September. Thank you so much. Thank you so much Heather. What a great idea. You are so very welcome to use this during your Home Study Group, which is a terrific way to grow in grace and knowledge and I perceive that you all are hungry to learn more of the Word of God. By the way, at the top of our Homepage, we have a Questions? search box so you can simply type in a key word or question and up pop dozens of related articles about your inquiry. We have written hundreds of articles based upon just about anything that has to do with the Bible and the Christians walk. You are free to use at your Home Study Group anything you find there and thank you for commenting and visiting us. Thank you for the fine article. Many Christians are intimidated when talking about the flood because they have been told it is un-scientific. But there is much physical evidence that points to a global flood. There are continent wide sedimentary rock formations that give evidence of having been laid down rapidly, with little or no erosion between the layers. Some of these layers that conventional science say were laid down over millions of years, actually show that they were bent while they were still soft and bendable, and so must have been laid down rapidly and then bent before they hardened. There are marine fossils found on mountaintops. Many fossils are buried in swimming positions, and have such preservation of detail that they show evidence of rapid burial, not slow and gradual. Sediment for some of these rock layers also seems to have been transported from very distant sources, not from a local deluge. This is just a sample of the many scientific evidences. But there is an even more convincing reason for taking the Flood literally. Jesus did! If we believe Jesus, we have no problem believing in a global flood, if we don’t believe Jesus, we have bigger problems than belief in the flood. Thank you Mr. Latorre. If Jesus mentioned it, that is enough proof for me. He also mentioned Jonah too as being in the belly of a great fish for 3 days and nights and also reference that God created them male and female, in Genesis so we know that evolution is false. Thanks for your encouraging comment. This is one story I keep forgetting,and I shouldn`t because God gave us a second chance. Can you suggest where I can read about this topic Jack. Hello Anthony. God is the God of 2nd chances…and 3rd and 4th and…to infinity….I love the story of the Prodigal Son because it reveals just how eager God is to have us return to Him in repentance after turning away from Him. God promises to forgive us of all of our sins and there is no limit set on this at all (1 John 1:9). Yes I do, it reminds me of my Farther I loved him,but the sad thing is he never said anything about religion. He went through world war II. To day they would recognize it has battle trauma or something like that. I was listening to John Piper last night,and he mentioned that article you wrote on predestine. He was interviewing another pastor who`s teaching method was the opposite of his. I fell down to Earth with a bump it`s that sin I have not done it now for six days and six night`s. Last night something very profound happened I was going to do it,but I asked God that I was depended on him to help me through it,and in the same sentence it said God always keeps His promises. I read something that Jesus said that “I don`t know You” when the time comes`s. After reading it I thought from what Jesus said I am on my way to Hell. With all this happening I did not commit that sin,and it blew me away God kept his promise I did not do it. The article was one of John Piper`s It was describing the sexual sin that evan Pastor`s did they committing adultery evan when they moved them to a new parish. Then it got very deep,and I could not understand it. I hope you can understand this jack,because I am not thinking clearly. It`s what Jesus describes that I found very damming I can only remember Jesus saying when the time comes Jesus say`s He does not know you,and it has left me all confused.Jack. The fact that you did NOT commit that sin shows that you are being convicted by the Holy Spirit Anthony. That is powerful evidence that you are a child of the King for it is for sinners who Christ will say “I don’t know you” because they could care less if they sin and don’t even believe that there is such a thing as sin. Christ does know you my friend for since the Holy Spirit is working in you to keep you from sinning as you said and since the Holy Spirit and Jesus are intimately known to each other and bound in a way that we can not even imagine, then Jesus MUST know you for whom the Spirit knows, so does Christ. Make sense sir? Also, you said that John Piper, who I really love to listen to…he offers free mp3’s and this man is a great, great teacher, you said that he mentioned the article on predestination that I wrote? That’s awesome that a man of God and such a sterling teacher of the Bible would even recognize my work, that is amazing. Glory to Jesus and to Him alone. Wow. (or did I get confused and you meant the Mr. Piper mentioned the subject of predestination I wrote about and not my article precisely?) Thanks brother. I did commit the sin afterwards on the seventh day,and I wondered what went wrong. Jack I must emphasis this, I do not want to commit this sin in fact it`s getting on my nerves. Mr Piper did not mention the article you wrote precisely,but he was saying almost the same thing that you wrote Jack. When I committed the sin on the seventh day thats when my world collapsed,because the article I was reading was all about sexual sin`s and has I said Jesus said at the end I do not know you. Does the very fact me being here,and telling you a fellow christian about it, but if I did not care I would not be on this site at all,so does this mean what you say Jack. I am going to go back to take a screen shot of that article. I feel has though I have a ton of brick`s on my shoulder,and it`s very heavy but I am not given up. Thanks Jack your words make sense about Jesus. I am still confused why I went 6 days,and on the seventh day I fell. I am constantly talking to God to do the things that He want`s me to do. Might I be asking of God for the wrong reason. I am very sorry Jack for putting up with me Thanks Jack. I went straight to where that article was the title was Sexual Sin In The Ministry by Harry Schaumburg. Yes Jack I can see you make perfect sense,and yes you are quite right I have been on this site now for at least two years now. It`s just sometimes I need to be reassured about this. One priest said the same has you more or less exactly has you put it. He added forgive your self if you don`t this will keep happening and he was angry but in a nice way. Thank`s very much Jack for your words of reassurance,and the bricks have just fell off my shoulder`s thank`s to you Jack. Imagine that you have made car payments for the last 48 months and you finally made the last payment. The car is now all yours. Then you get another payment notification from the bank for another car payment. You’d be outraged right? Think how God must feel if you keep dragging up the same sins that you have already had forgiven and you do this over and over again. When Jesus said on the cross “It is finished” the Greek wording essentially means “Paid in full.” God has paid in full what we sometimes want to still make payments on. When we don’t forgive ourselves after God already has, we are robbing God from the glory that Christ paid so enormously for at Calvary. We certainly don’t want to rob glory from Christ but we most certainly do when we confess our sins and we forgive others but fail to forgive ourselves. When God buries our sins in the sea of forgetfulness, He then puts up a “No Fishing” sign. How right you are helping me Jack. I know God is working through you sorry about the bricks they fell off when you helped me. I might have some more later on. That`s really good how you put over “How to Forgive Yourself”. It`s exactly what I am doing I never thought of it that way. The thing that makes angry the Catholic Church never taught me all the real issue`s that I have learnt on this site about what the bible say`s. Instead they hammered into you the doctrine of the Catholic Church instead of what you are teaching me Jack and it`s all out of the bible and I have found out the truth by your help. I used to hate religion at school they punished you if you did not know the answer. Not now that`s why I am still on this site by what you have just written it`s a joy to learn this,and many more things you have said Jack. Maybe you didn’t know but I had instruction when I was young and used to get smacked or had my knuckles whacked when I didn’t know the answer. I once thought, “What would Jesus say if He walked into that classroom and saw what the teacher was doing>” I am sure He would not be happy. Hey, I am so glad you have been such a blessing to me Anthony. That God could use a broken, empty vessel that HE had to fill up is incredible. God can still use train wrecks like me and put us back on track. I am surprised you got punished for not knowing the answer I thought only Catholics were punished because I used to walk to school with protestants and they did not know what religion was. Yes I fully agree with you what would Jesus say if He came down today. A man was standing in the square of the Vatican and he said I wonder what Jesus would say about the Vatican. They are worth billions of dollar`s and they are classed has a country. A lot of banks deal in there because of the laws like in your country and mine don`t exist. Someone who has committed murder can go in there,and be protected. There is nothing anybody can do it`s up to them to hand him over the Italian police. I think God fixed the broken vessel without you knowing Jack. Great to hear from you again Anthony. I was forced to go to Catchecism and got my knuckles rapped more than once and I was told to not ask too many questions but God has used this to show me how NOT to be to the church that I am under-shepherd of. Your concluding paragraph was spot on sir. The most important thing is to believe in Jesus and Jesus is Head of the Church. I am only an under-shepherd and must have the humility and wisdom to know that He is God and I am not and that I will leave those things that I can not change to Him Who can. If you had a Catechism were you a Catholic Jack, because as far as I know nobody else had one. The Priests terrified you to death they nearly always finished off with you are on the road to Hell. Today the Catholic Church is not very well attended,and hardly anybody goes to church. There is also a very serious shortest of priests. That said the real power is the Vatican. What goes on in there is very guarded secrets. When I was on the site before this I got wrong for saying that there has been murder`s in the Vatican off a moderator. I told him if he read this certain paper it`s there in Black and White. One Swiss guard shot the captain,and he shot back leaving them both dead. The mother of her son was one of them,and till this day they will not tell her a thing. The Italian police can`t do a thing because it`s classed has a different country. Very sad. Yes you are spot on Jack. It`s a good job I am not judging them,and I would not make a good job has God either. Anthony, you are not making me “put up” with you. It is a pleasure for the Bible tells us to confess our sins to God first but also to one another and that is what you have done. I don’t think there is anything significant about this happening on the seventh day but the good news is if you look back over the last year or years, you have grown more holy, have you not? I would imagine that you have. You seem to have since I’ve even known you my friend. Yes, the very fact that you are here….and you are concerned about this…that you listen to good preaching (i.e. John Piper) and that you see sin for what it is. The lost…those who Jesus doesn’t know…don’t even acknowledge that sin even exists and therefore, Jesus doesn’t know them because the Holy Spirit is not convicting them of their sin or showing them they are a sinner and whoever the Holy Spirit know, surely Jesus does also. Make sense Anthony? Just before I head off to work let me say that everyone will stand before God and give an account for every idle word and every idle deed and we don’t want to be them on that day…for they are a kingdom to themselves at times and I would rather be you or me in that day when we all face Jesus. For us He is our Savior and our King…for others, sadly, He will be their Judge and Jury.